Around 7,000 Catholics followed their Eucharistic Lord through the streets of Sydney yesterday, for the annual Walk With Christ procession. 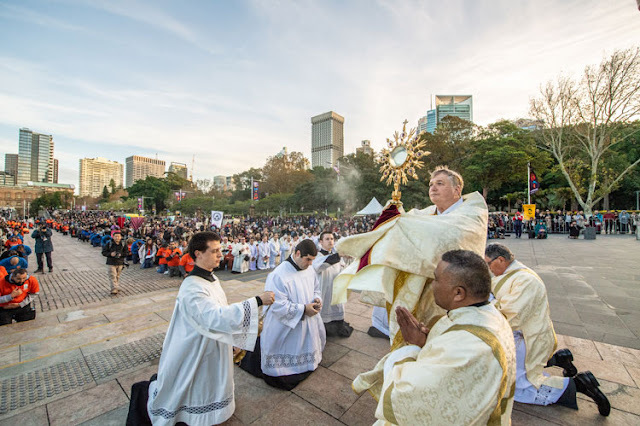 This year's procession, on the Feast of Corpus Christi, coincided with the 200th anniversary of adoration of the Blessed Sacrament in Sydney, making it a particularly momentous occasion. Beginning near the corner of Martin Place and Pitt Street in the city, the Blessed Sacrament was carried in procession with thousands following. Archbishop Anthony Fisher OP led proceedings, along with Auxiliary Bishops Anthony Randazzo, Richard Umbers and Terry Brady. Numerous priests also took part in the procession. Along the way hymns were sung and prayers recited, including the rosary and Divine Mercy Chaplet. Participants were quiet, prayerful and reverent, amid the curious glances from on-lookers and passers-by. Many carried banners proudly representing their local parishes. The procession made its way to the forecourt of St Mary's Cathedral for adoration and reflection, during which many knelt in silent prayer before the Blessed Sacrament. NSW Police have estimated there were about 7,000 people in attendance. During his homily Archbishop Fisher recounted the story of Fr Jeremiah O'Flynn, the only Catholic priest in the Colony of Sydney in 1818, who left the Blessed Sacrament with the lay faithful before he was deported back to England. "That preserved sacrament became the focus of Catholic life ... what those people knew was that the most precious thing in the world is the Blessed Sacrament," Archbishop Fisher said. Those pioneering Catholics, he said, would not have imagined that 200 years later there would be 5.2 million Catholics in Australia, 1400 parishes, or that Sydney would sport one of the most beautiful cathedrals in the world. The Archbishop also referred to the enormous contribution Catholics have made to Australian society in the form of "10,000 hospital beds, 20,000 aged care beds, 45,000 tertiary education places, 700,000 school desks and innumerable acts of service and care every day". He urged those present to "not forget the struggles of our ancestors and what they have bequeathed to us" or that "this Blessed Sacrament is but a foretaste of the heavenly banquet to come". The Archbishop then led Benediction during which he blessed the crowed with the Blessed Sacrament. Mark Baylon from the Schoenstatt community said the event shows "the unity within the Catholic Church". "We just want to be here and celebrate with everyone," he said. "To see people from different congregations and parishes is so nice. It's great to see a lot of people coming here and celebrating the Catholic faith." Favria from St Calvin's Parish in Eastwood said it was her first time at the Walk and she was surprised by the size of the crowd. "It was fantastic. I'm surprised there are so many people here. It's my first time. That we can walk together with Christ, it's really an amazing time." Several parishes around Sydney also held their own Eucharistic processions, to mark the Feast of Corpus Christi.